When you start your own business, you learn pretty quickly to roll with the punches and wear the many hats required to keep your dream afloat. Melisa Lin, the creator and CEO of Nommery, certainly knows how to evolve with her business. What is Nommery you may ask? Nommery is a new kind of social network that brings people together and fosters new friendships and relationships over amazing food! This brain child of Melisa's has grown over the years into a super successful startup that is making waves in Los Angeles and San Francisco and is sure to come to a city near you! Let's start at the beginning! What is your background? Before founding Nommery, I dined with thousands of strangers at great restaurants across the U.S. as a hobby. At the time, I was working in sales at the nation's oldest organic produce distributor. Previous to that, I worked the night shift in operations with stints driving a forklift. Before that madness, I founded three food businesses while studying Sustainable Food Business at UC Berkeley, a self-designed major with mentorship from Michael Pollan. I entered U.C. Berkeley with senior standing since I started taking community college classes in middle school and took 16 A.P.s in high school. In essence, I love learning and figuring out how I can make the biggest positive impact with my life. How did your hobby evolve into the creation of Nommery? I loved meeting fascinating people over great meals at restaurants and took all my vacations to fly to cities across the U.S. to dine with friendly foodies. In all, I founded 14 Meetup social dining groups across the U.S. for fun, now with more than 28,000 members. It was incredible to watch members meet over a meal, and go on to travel the world together, help each other find their next jobs, or even get married. Our flagship group, the San Francisco Foodies, had more than 2,000 events in our first four years; we had 127 events in our top month. I wanted to help more people easily meet new friends, network, and date by connecting over the original social connector, shared meals. So, I incorporated Nommery and started building our website. What do you do on a day to day basis for Nommery? Do you have any other day job? I work closely with Nommery's CTO, Adam Berlinsky-Schine, seven days a week. 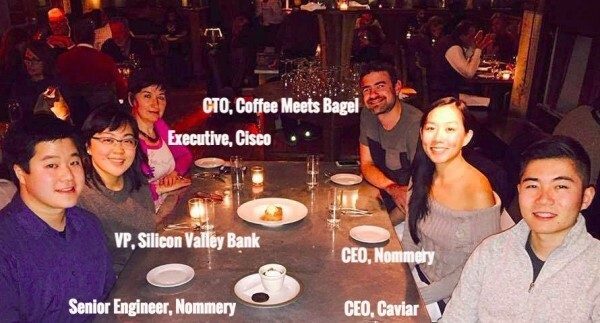 We met 3 years ago at an SF Foodie event, and he was Nommery's main technical advisors for two years before joining as our CTO a couple months ago. Previously, Adam was Coffee Meets Bagel's CTO, scaling the dating app internationally to millions of users over the last four years. We are laser-focused on building and scaling Nommery. Day to day, I'm marketing Nommery, onboarding communities, QA testing new features, filing legal paperwork, creating events, and attending events. Our COO has worked in the restaurant industry for 30+ years and manages all our restaurant partnerships and event operations. What do you love most about Nommery/ your career? I love our happy customers. Few things make me happier than hearing a member say that they met someone awesome at a Nommery happy hour, brunch or dinner. Everyone dreams of meeting someone who could change the course of their life. We make it happen, and want to make it happen more often. Through Nommery meals, I've had the privilege to meet phenomenal mentors including the VP of eCommerce at Walmart and President of TopGolf. We've featured dinners with Fortune 500 executives, investors, founders, incredible chefs, and world-class artists. Some of our most popular dinners featured the founders of Hint Water, Rotten Tomatoes, Caviar, and Nomiku. Were there any setbacks that you have had over your career that turned into positive movements in your career? Plenty! One of the most memorable setbacks was the loss of my first developers. My first CTO is a friend from SF Foodies who works as a Senior UX designer. We hired one of my friends, a former colleague who had just graduated from a coding bootcamp, to build our Minimal Viable Product, the first version of Nommery. She reviewed our feature specs, and estimated build-out times for each, totaling two months. We had weekly reviews to track progress and debugging. The build stretched into three months, then four, at the end of which, there were only 2 completed features, and several half-built, all with super buggy code. We had to scrap it all, and parted ways. Soon after, my then-CTO decided to focus on his full-time job and a relationship with someone he'd met in SF Foodies. I celebrated their wedding with them recently. It was one of the incredible relationships to come out of our social dining network. What is the best piece of career advice you have heard? Do you have any advice for our readers on creating their own opportunities? Steve Jobs once said "people with passion can change the world." At his 2005 commencement speech at Stanford University, Job's said “You've got to find what you love. The only way to do great work is to love what you do. If you haven't found it yet, keep looking. Don't settle. As with all matters of the heart, you'll know when you find it." Passion has kept me going through Nommery's toughest times, when it looked like all the cards were stacked against us and seemed like we should just fold. I recommend following your passion as a hobby first before taking the leap and building it into a career. Ideally, you're making enough money from your passion on the side to seamlessly transition over from your current full-time job into your new career. I saved up for a two-year runway before taking the leap to focus on building Nommery. What is your goal for yourself and Nommery in the future? My goal is to make the greatest positive impact possible with my life. Ideally, we'll scale Nommery nationally, and then internationally to connect everyone all over the world through delicious life-changing meals together. Stay updated with Nommery on Facebook and Twitter @Nommery.